The Democratic firebrand Bernie Sander's keeps harping on this point about income inequality in the United States, yet I have to wonder, how bad is it really and do we care? First off, there is a legitimate reason to ask, if we should care. After all, throughout history, nations have gotten more wealthy with some people getting a bit more of the wealth over time yet things seem to keep going. So long as individuals feel that they can have reasonable access to opportunities for income growth and that a significant portion of the population is not living in poverty, things are okay, right? Yes, but maybe there is a point at which income inequality can grow so vast and its influence over government so enormous that that which used to be a democracy ruled by the people becomes an oligarchy ruled by the few. But politics is not what I am here to talk about. I am here to ask if inequality is getting worse or better and what are the effect of inequality on the less fortunate in society. In order to address this question, I will use US survey data from 1980, 1990, 2000, 2005, 2010, and 2013 sampling 200,000 individuals from each year. The first figure is more or less what we would expect. We can see that the top 1% has increased in earning capacity massively since the 1980s. In terms of income in contemporary dollars income seems to be increasing throughout the population. 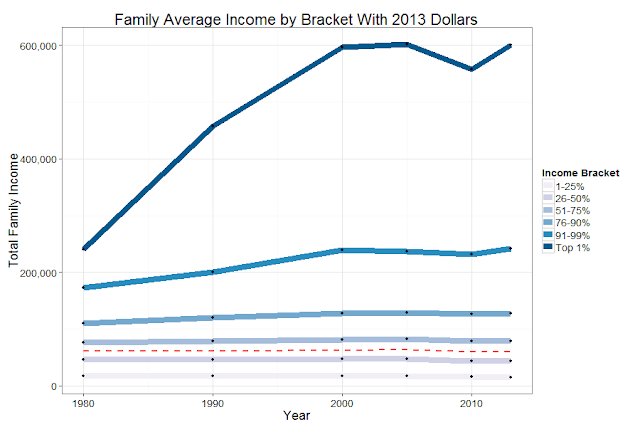 Figure 1: Family Average Income by Bracket. Looks like more or less everybody is increasing over time. Remember for the top 1%, incomes are top coded. This means that this is likely the lower limit of the true value for those top income makers. The red dotted line is median income. 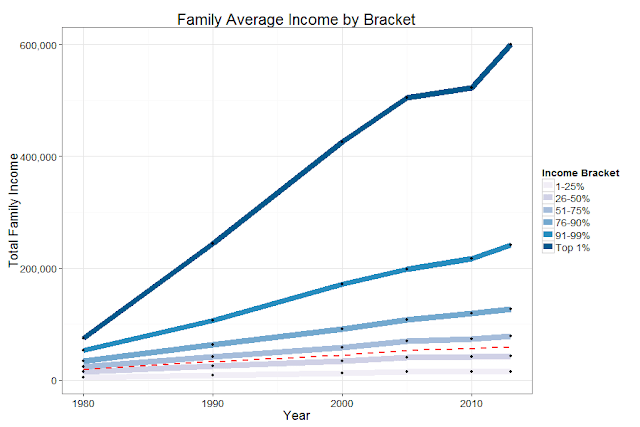 We can see that the income being made by the top 1% has grown significantly over time. Looking at the next graph we can see that compared with the median household income this growth has been huge. 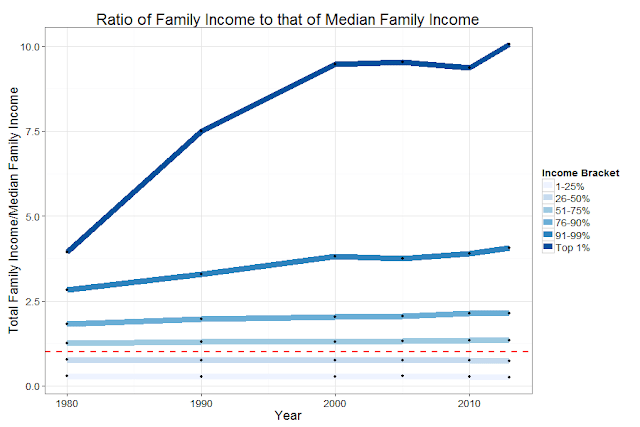 Figure 2: Income relative to that of median household income. From Figure 2 we can see that the top 1% have increased in earnings significantly since the 1980s from making on average a minimum around 4 times that of the median household per year to that of minimum 10 times. The reason I say minimum is because the census does not release true earnings numbers but rather median earnings which are a lower estimate on a strongly skewed value. But what does this all meaning for buying power and the ability individuals have to pay for living expenses and that of their families? Figure 3: Incomes by Bracket adjusting for inflation (based on Consumer Price Index). 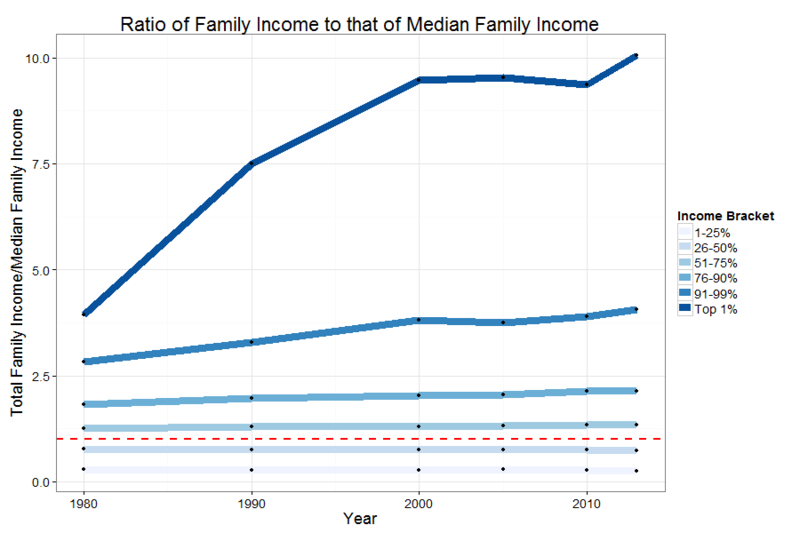 The red dotted line is median income. Figure 3 starts to show us that things are not necessarily as good for everybody involved as they appear in Figure 1. 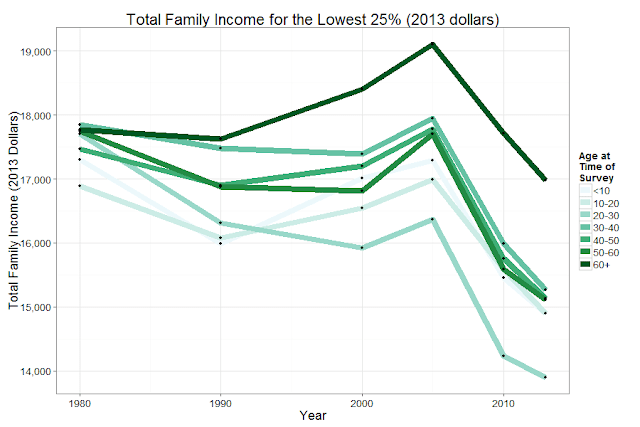 First off, median income seems to be holding constant. 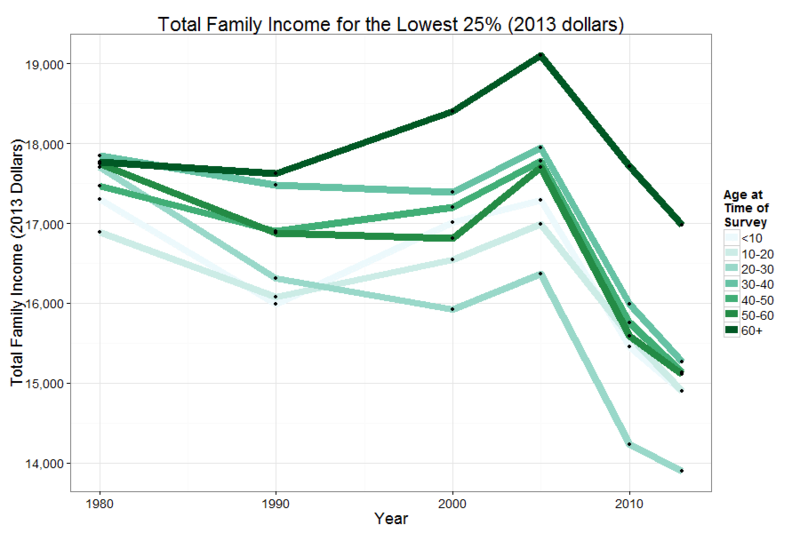 Second, though it is difficult to see, the bottom 25% of families seem to be loosing income. How significant is that loss? Figure 4: Total Family Income for individuals at different age groups. Looking at Figure 4 we can see that for the poorest 25%, all age groups have experienced a dramatic reduction in total family income since the 1980s. Those 60+ are somewhat immune from the worst of these falls in income probably due to social support programs such as social security. So is the cost of living decreasing to match the falling income? Figure 5: The cost of rent for the bottom 25% of the population sliced by age group. 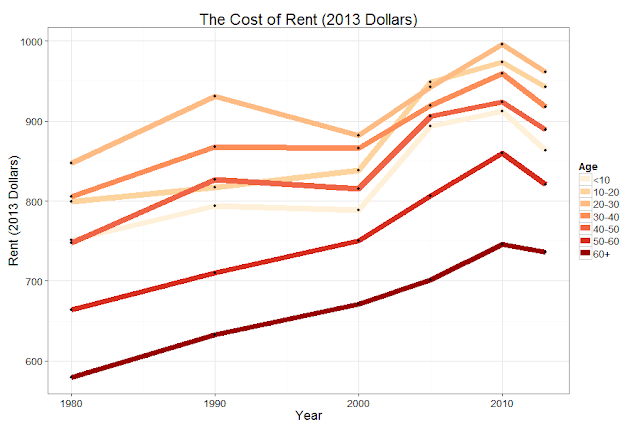 From Figure 5 we can see that the cost of rent has significantly increased since 1980 with all age groups being hit hard. Though information is not available in the census the cost of higher education has increased a staggering 538% since 1985 while medical costs have increased 286% relative to increases in the CPI of only 121% (Source). So how has the decrease in earning power and increase in cost of living affected vulnerability to poverty? Figure 6: The likelihood of being in poverty by age group at time of survey. From Figure 6 we can see that the affect of decreased income coupled with increased costs has created a situation in which a higher proportion of the lower 25% are at risk of being classified in poverty as at any time since the 1980s. Different age groups suffer from different levels of risk though clearly minors are at the highest risk with over 70% of them being raised in poverty in 2013. Why are America's less fortunate so much more vulnerable to poverty than before? Are the poor giving up on school? 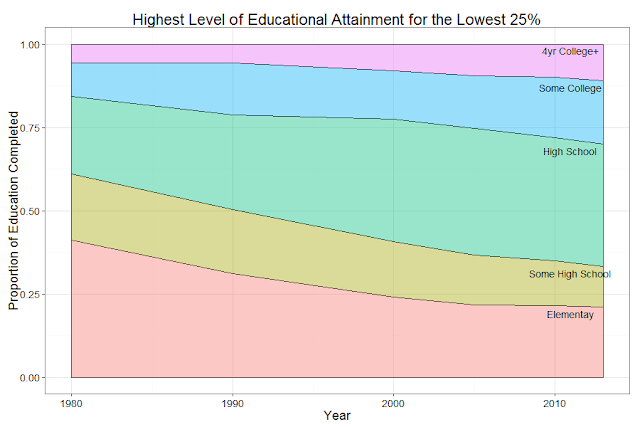 Figure 7: Highest level of attainment for the lowest 25% of the income spectrum. From Figure 7 we can see that the lowest 25% of society has higher high-school and college completion rates than at any time ever in our data. Is it just that people are poor because they can't find employment? 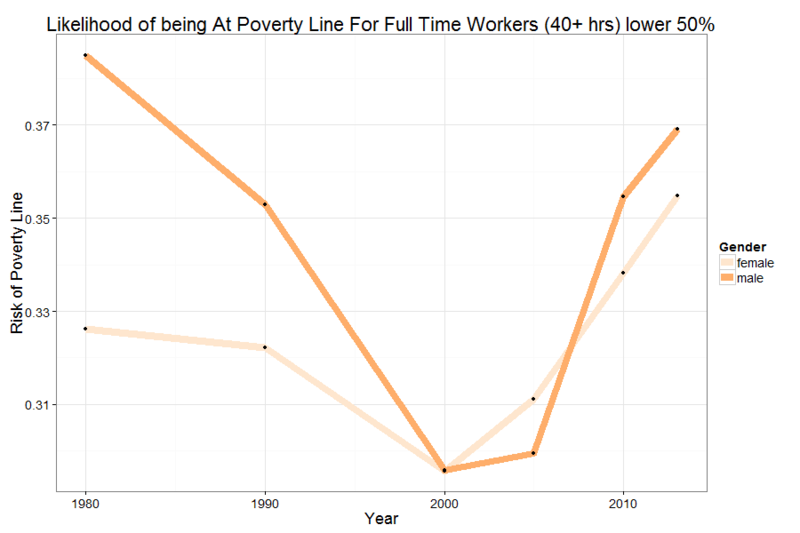 Figure 8: The likelihood of being poor if you work 40 hours or more a week. From Figure 8 we can see that working 40 hours or more a week does not insulate one from poverty if you are among the bottom 50% of the poorest families. Whether you are a male or a female you are more likely to be in poverty while working full time today of any time since 1980. Is there any way to measure the effect of poverty on the health of families and individuals within our dataset? Unfortunately the census data is surprisingly lacking any indicators mental state or that of physical or mental health. What small measure we can look at is that of marital status inferring that happy people are more likely to stay married while unhappy ones, especially those under a lot of stress are less likely to stay married. Figure 9: Likelihood of being divorced by income bracket. Now it seems to be frequently argued that marriage is under attack within society in general. 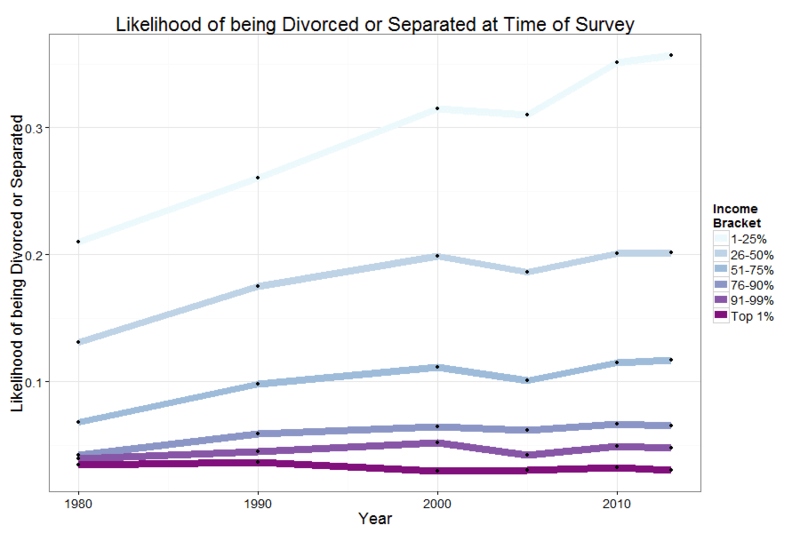 However, when looking at Figure 9, we can see that marriage seems to be more under attack for the poorest segments of society with the bottom 25% more than 10x more likely to be divorced or separated at the time of the survey than that of the top 1%. 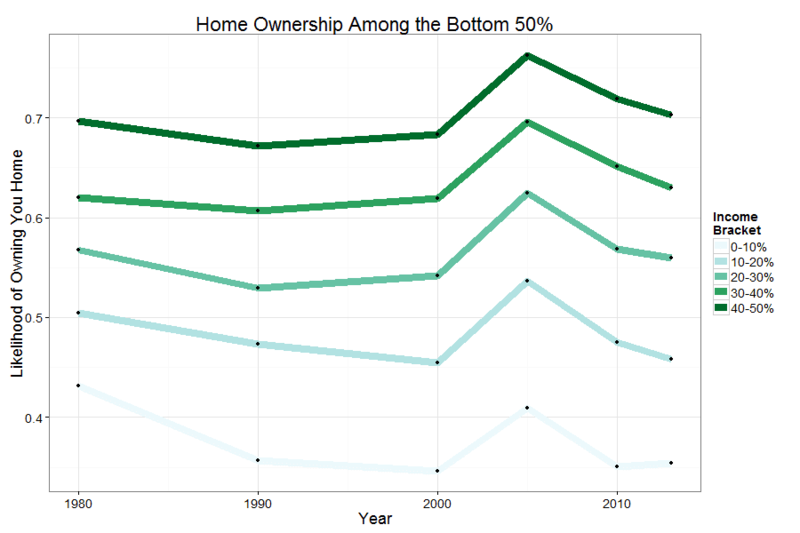 The decreased earning power of the bottom 25% is also reflected in a decreased ability to purchase and retain capital in the form of home ownership. 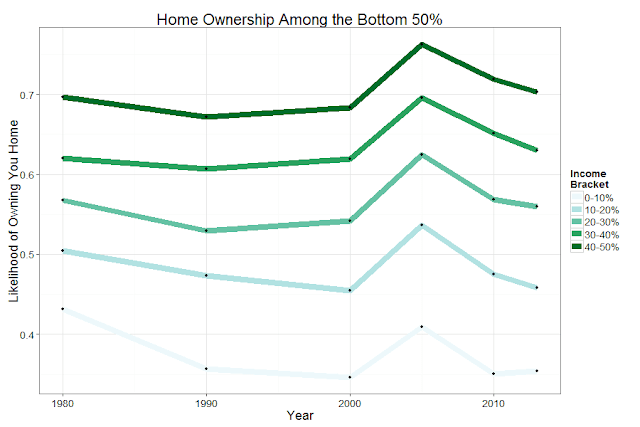 Figure 10: Home ownership over time by income bracket. From Figure 10 we can see that home ownership, apart from a brief spike in 2005 has decreased dramatically for the bottom 20% of the population since 1980. If you look more recently, home ownership has decreased dramatically within the last decade for all segments of the population. Democratic presidential candidate Bernie Sanders has claimed that income inequality is leading to the rich getting richer and the poor getting poorer. Nothing in the results presented here have contradicted this claim. Since 1980 the wealthiest segments of our population have increased in income level from making on average 4 times that of the median income to that of 10 times. At the same time, the poorest 25% of society now how less purchasing power than they did in the 1980s while the cost of rent, education, and health care have all risen. 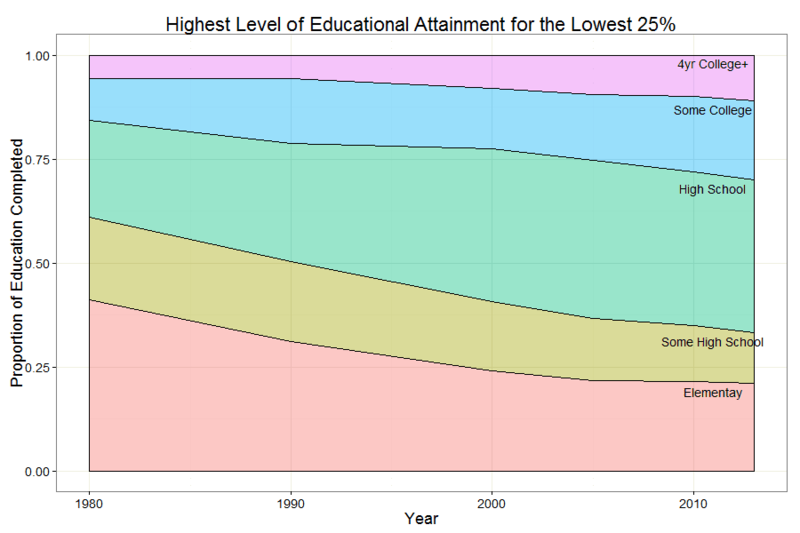 Despite having the odds stacked against them, the poorest 25% are better educated than at any time in history. Yet, their incomes have continued to falter while their divorce rates have grown steadily higher. We must therefore conclude that the society we live in today is less fair to the poor than it was 35 years ago despite the earnest efforts of the poor to become more educated. The source of the data is from IPUMS-USA. In order control the effect of disproportionate representations of ages across years each year sample has been reduced so that a constant proportions of all ages have been represented for each year. To create these graphs on your own you can find my code here. You will need to request your own data from IPUMS. Interesting post! It may be of avail to use the Gini index (package 'ineq') as a measure for inequality. Nice comprehensive analysis! Each figure flows well to the next, and it tells a compelling story. Can you clarify whether income is before or after taxes and government transfers? "FTOTINC reports the total pre-tax money income earned by one's family (as defined by FAMUNIT) from all sources for the previous year." This does include government welfare (subsidy) income. In that case this data overstates the level of inequality. Yes but only if you are forgetting that those above a certain level of income are top-coded. That is, the top income earners are considered all to make income at the state median income for top earners. Being how it is almost certain that this distribution is massively skewed to the right, it is most likely that the income inequality is much greater than that reported here. Other sources of evidence of income inequality find must larger differences between the top and the bottom. Thank you for your post. Interesting. My quibble would be that the statement "We must therefore conclude that the society". While I believe that statement to be true, you data are not conclusive. We'd need to include transfer payments and aid into the mix. For that matter, taxes should be taken into account. If the top are earning more income but it is being taxed (and given to the poor) our society is not less fair. I don't think this is the case, but the point of all this is to back up hypothesis with data. Also, the discussion ignores wealth. I know wealthy people with low incomes (lots of real estate, no job) and high income people with no wealth (they spend and borrow). Inequality is not merely a matter of income, it's also a function of wealth. Excellent points. I am in complete concord with you. However, census data is very limited with no information regards federal taxes. Perhaps a different data set might have this valuable information. Overall, I accept your critique fully but point out that even if we had more information, the story probably would not change. If anything I believe we would see that the top 1% are making far more money than is reported here (almost certainly) and that they are also paying much less in total taxes on earnings due to capital gains advantages and tax deductible company perks, etc than that of their less affluent counterparts. But, I do not have access to this critical data which is closely guarded by the big four accounting firms. The graphs presented may not contradict Bernie Sanders but neither do they confirm him. I don't think that figures like figure 1 mean much. One would be interested in obtaining similar data for periods where it is generally agreed everyone was getting richer. The top 1% probably always show a similar growth curve. After all, they are in a unique class; usually entrepreneurs. They don't, strictly speaking, prosper via income like one who gets a paycheck. The period from 1980 started with an economy that had experienced years of decline and with it came a compressing of income levels. Significant growth occurred in the years that followed. Why would one expect all brackets to show similar increases? Also, except for housing there is no data on the disposition and consumption of other goods and services. Even in the poorest neighborhoods one sees an abundance of wide-screen TVs, satellite dishes and late-model cars. Then there is the definition--largely arbitrary--of poverty. There there is the problem of defining inflation. As I recall, different parts of government use different indices (deflators). Finally, data that depends on "likelihood" needs to be presented with a precise definition of likelihood. Of course, none of this should be taken as a criticism of the nice graphs presented in this discussion. 1. " One would be interested in obtaining similar data for periods where it is generally agreed everyone was getting richer. The top 1% probably always show a similar growth curve." Good point! The data is publicly available and if you would like to reproduce it using my publicly available code it goes all-the-way back to the 1790s. I believe all of the code should function the same except you just need to select more data. 2. "After all, they are in a unique class; usually entrepreneurs." I would like to see numbers on this. If this is the case then I would care a lot less about the issues. My understanding is that relatively few are entrepreneurs by the definition of them starting new business but are rather those who have inherited significant wealth and have reinvested it in such a way as to increase their fortunes. 3. "Also, except for housing there is no data on the disposition and consumption of other goods and services." The CPI (consumer price index) is the scaling factor which adjust the dollars into 2013 dollars and is based on a bundle of goods believed to be widely consumed at the time. If you believe this bundle of goods is an accurate characteristic of what people are likely to buy over the time periods in question then a decrease in income based on that means a real decrease in purchasing power parody. 4. "Even in the poorest neighborhoods one sees an abundance of wide-screen TVs, satellite dishes and late-model cars." Yes, there are certain goods that become cheaper over time. TVs and other technology is one of these goods. I believe they are represented within the CPI. However, I suspect relatively few people spend a significant portion of their income buying TVs and old model cars. 5. 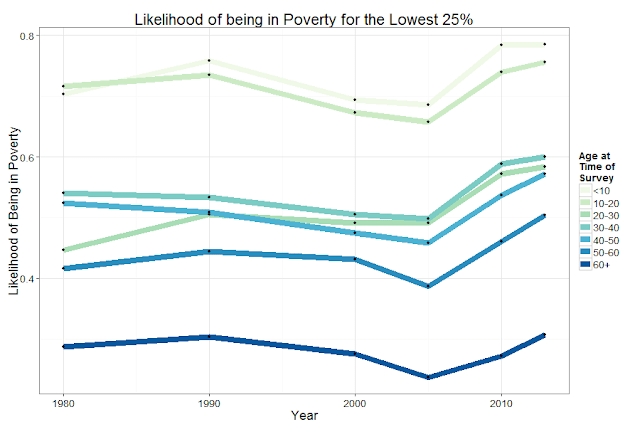 "Then there is the definition--largely arbitrary--of poverty." I cannot argue with this. I could image a family that owns their own home and raises some of their own food living quite well on k15 per year while another family living in new york on 40k per year could be really struggling to pay rent and keep food on the table. Thanks for doing this - I like it. I too would like to see wealth considered. I haven't found a source for wealth info, in this state, though. 1 - "The top 1% probably always show a similar growth curve." No. Two previous periods where the income skew was this large were The Gilded Age and the roaring 20s. Those who trumpet the need for extreme skew in income/wealth most always name the 19th century America as wonderous. In fact, the 19th century America was mostly deflation (due to gold as the only currency) and depression. Read it up. 2 - "After all, they are in a unique class; usually entrepreneurs." The handful of families financing various Republican presidential hopefuls are old money. Yes, Brin and such are relatively new, but hardly the paradigm for the .1%. 3 - "Even in the poorest neighborhoods one sees an abundance of wide-screen TVs, satellite dishes and late-model cars." I grew up in a housing project, many years ago, and noted the decrepit buildings and late-model used Buicks and such. There's a reason for that: with very limited funds, and no ability to own a house, the best thing one can buy is a pretty used car. Still true today. Would you prefer they live like rural Chinese? Fact is, if one wishes to do the research, cars and household durables are being sold on subprime principles: car loans now reach to 84 months in order to get a monthly payment that the marginal can afford. 5 - "Then there is the definition--largely arbitrary--of poverty." Well, the Bible tells us that the poor will always be with us. What makes the USofA different is the degree of degradation inflicted on them by government/society compared to the other 1st world countries. Some may consider this a good thing. There is no evidence that smart people would stop doing smart things if they got a slightly smaller piece of the pie. Moreover, given the Tyranny of Average Cost™, much of the widgets sold today are the result of high capex, and thus if the 47% are shut out of consumption, the price of said widgets will necessarily rise substantially. "We lose money on each widget, but make up for it on volume" is often offered as the folly of stupid business. But, if your production process is heavy on fixed cost, as is true for much of we buy (robots, and such), then increasing output is the only cure for loosing money per widget. This article is simultaneously one of the most informative and objective analyses of the growing wealth gap in the USA. The visualizations were relatively standard, but they were very effective for helping to understand a given data set. Thanks for the nice summary! Number of earners per household has declined. There were roughly the same 1- and 2-earner households in 1980, now there are 16% more 1-earner households. Also the number of no earner households went from being 60% of the number of 2-earner households in 1980 to 76% in 2014. Since "poverty" is defined by income rather than number of mouths to feed, simply having one less earner may actually make you "richer". Controlling for household size changes these numbers quite a bit. That said, a couple in which both parties is are earners will be "wealthier" than two single people since the additional income required for each HH member is $4,160. Thinking this over though, this is not entirely unreasonable since being in a family allows people to share housing, food, and other resources more effectively. Sorry I was not more clear, I put poverty in quotation marks because the first couple graphs are by income percentile and I thought the data showed you can just add households to the left tail but they are structurally different over time. Therefore they are not (necessarily) poorer. I agree that the official poverty definition accounts for household size. Thank you very much for the respectful and thoughtful responses! Update: I found the article that decomposes inequality by household size. It has been flat for individuals since 1961 but increasing for households and families. Three part series from 2013. This is interesting. I am surprised that they have not discussed the top coding for top income makers within the census data. I believe that this is arguably what is most concerning among those discussing income inequality. Another feature that I noticed in the data is the burgeoning bubble of baby boomers. As this age group represents a larger than typical demographic group they tend to exaggerate the earning capabilities of the middle earners since people tend to earn more later in life. However, I will revisit this with consideration to some of the issues brought up by the articles you have pointed out. Thanks!